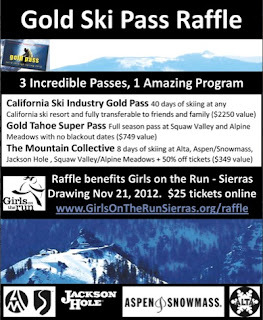 Three great ski passes are up for raffle to benefit Girls on the Run- Sierras. You could win one of 3 passes. · California Ski Industry Gold Pass: 40 days of skiing at any California ski resort, transferable to friends and family ($2,250 value). · Gold Tahoe Super Pass: Full season pass at Squaw/Alpine, no blackout dates, ($749 value). · The Mountain Collective: 8 days of skiing at Alta, Aspen/Snowmass, Jackson Hole, Squaw/Alpine, and 50% off on additional days ($349). Girls on the Run- Sierras is a 501c non-profit organization that provides a youth development program for young girls in the Tahoe/Reno area. 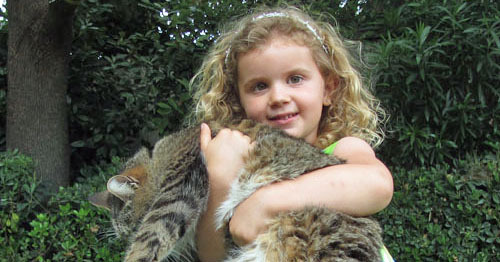 Their goal is to educate and empower girls at an early age to prevent at-risk activities in the future.